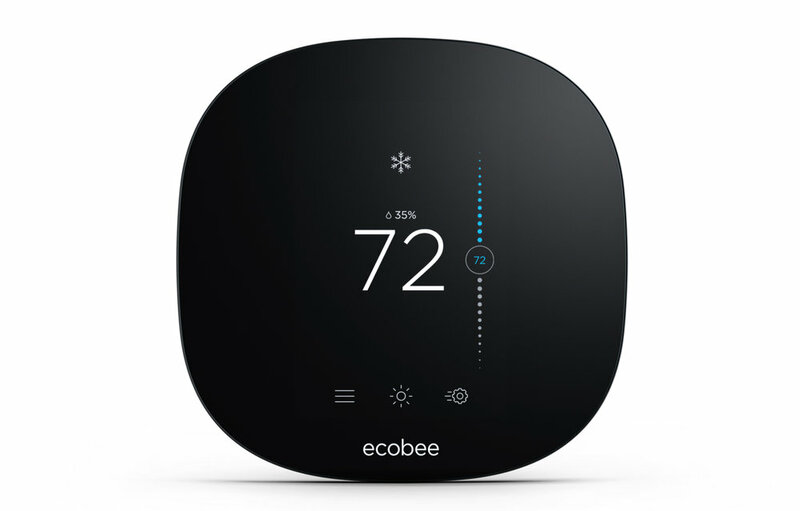 I recently purchased an ecobee3 lite smart thermostat for The Overlook, a vacation rental property my wife and I own. It's one of those where you can control the temperature remotely via an app. The decision to go with ecobee came down to service and support. The company uses a customer-centric approach to its product design, its pre-sales support, and its customer service. Ecobee also takes voice of customer (VOC) feedback seriously, and does an impressive job deploying both Net Promoter Score (NPS) and Customer Satisfaction (CSAT) surveys. Ecobee's Director of Customer Service, Andrew Gaichuk, was kind enough to share some insight into how ecobee uses VOC feedback to stay on top. I considered a number of different options before purchasing the ecobee3 Lite ($169 on Amazon). It had received a number of good reviews. A vacation rental I stayed in a few months ago had the same model and it was very easy to use from a guest perspective. Ecobee even has this simple tool on its website that allows you to verify compatibility with your house's heating and cooling system. These factors, coupled with a poor support experience from one of ecobee's main competitors, cemented the decision. Installation was a breeze with this helpful online guide. There were also easy-to-follow instructions in the box along with a few extras such as a plate to cover the hole in the wall left behind from your previous thermostat. Once installed, I downloaded the ecobee app that lets me adjust the heating schedule remotely. This is a big plus since I'll be able to lower the temperature whenever guests check out, which means a lower propane bill this winter. Best of all, it's easy for guests to use. Temperature adjustment is intuitive and simple, with a slide of the finger being all that's required. Customers get an NPS survey two weeks after registering their ecobee. The survey arrives via an email sent by the NPS survey company Delighted. This is a good way to deploy a Net Promoter Score survey, since it asks how likely a customer is to recommend a company's product or service. Gaichuck explained the rationale behind sending the NPS survey after two weeks. "This gives the customer enough time to experience the product and feel the benefits of ownership." This was certainly the case for me. The Overlook had guests the first two weekends after I installed the ecobee, so I was already getting a sense of how the thermostat was working. Many companies make the mistake of sending out an NPS survey after each customer service transaction. This really isn't the best tool to assess customer service alone, since likelihood to recommend is based on many more factors. In the case of ecobee, the purchase experience, installation, and the product itself all weigh on whether a customer would recommend the product to a friend. Ecobee's NPS survey also has an open comment question. This allows customers to provide additional detail on why they gave a certain rating, which can be analyzed later. The survey asks just two questions, a rating question and an open comment question, yet it's a powerful tool because Ecobee uses the data correctly. Ecobee's customer service team follows up with anyone who gives a rating of six or lower on the likelihood to recommend question. In NPS parlance, people who give a 6 or lower are known as detractors, so this is a chance to dig deeper into customer feedback or perhaps even save the customer. Gaichuk and his team also analyze NPS survey comments for trends. "We define trends through key words such as Customer Service, Installation, Wifi, etc. to help narrow down what key issues customers are experiencing so we can action it for future improvements. 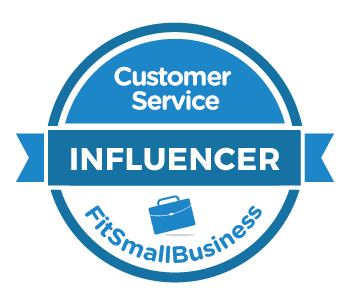 For example if we see any detractor for 'Customer Service' we can investigate the interaction, determine the issue and provide one on one coaching/feedback with the CSR." 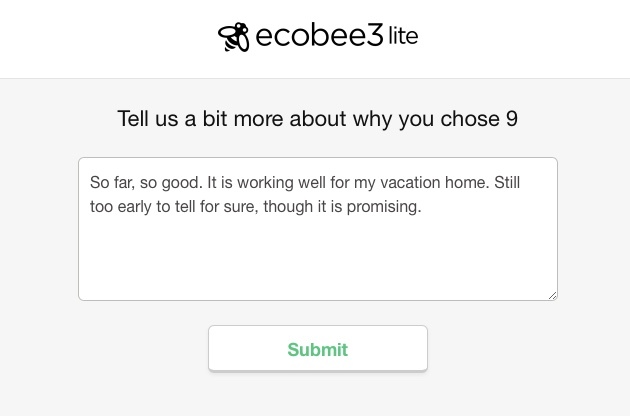 Customers who contact ecobee's customer service team receive a CSAT survey at the end of the interaction. 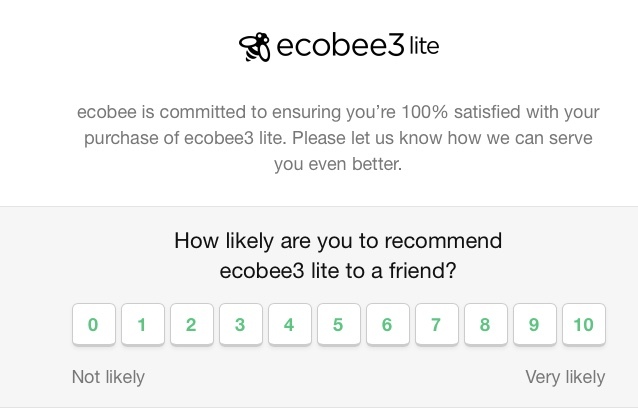 CSAT is a much more appropriate survey type than NPS for service transactions, so it's good to see ecobee using both NPS and CSAT in an appropriate way. Ecobee uses Zendesk customer service software, which has a built-in survey question that simply asks customers, "Are you satisfied or unsatisfied?" Like the NPS data, Gaichuk uses these responses to identify trends. "I can measure these C-Sat scores by department, CSR team or agent level. The Supervisors are each responsible to review the Unsatisfied results with their respective team members and identify areas for improvement." Ecobee's customer service team currently has an outstanding 91 percent CSAT rate. The company sends customers a survey as a post-transaction email. My research shows this is a best practice, and Ecobee enjoys a robust 19 percent response rate. According to Gaichuk, the customer service team uses the survey invitation to create another positive customer touch point. "In early 2017 we changed our call process so CSR’s are now responsible to email the customer a summary of the call interaction. This is a great way to finish the interaction, wow the customer and provide them any additional information that may help. 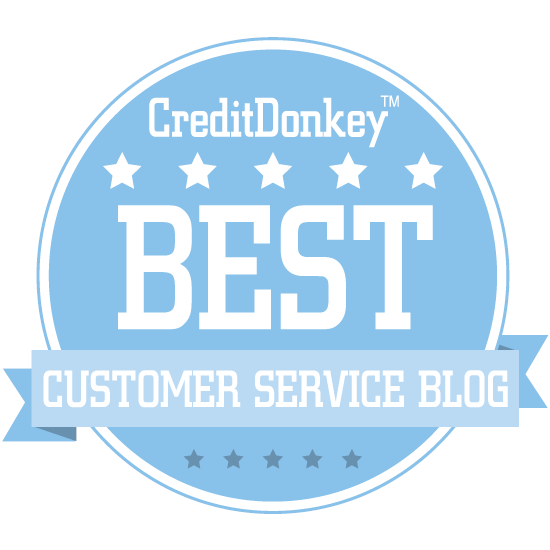 As a result the customer is provided the ability to rate the CSR’s support they provided." Writing this blog post means I'm definitely recommending the ecobee3 Lite to friends and colleagues. The product is excellent, though I think it's the service and support that really makes the difference. Perhaps most impressive is how Gaichuk and his team at ecobee are using customer feedback to continuously improve.